Timotha Lanae is an American soul songstress, a dynamic dancer and an award winning theatrical performer who seamlessly joins together her passion for music and theater. Born and raised in Minneapolis, USA, Timotha Lanae is one of the most prominent and significant artists to emerge from the post – Prince era Minneapolis music scene. Named after her father, Timothy, Timotha credits his rich musical collection as being responsible for her love of music. She grew up listening to her father’s music collection of 50’s legends, the Motown artists of the 60’s, the R&B/funk/gospel artists of the 70’s and the Minneapolis sound of the 80’s. The first track on her debut album RED, Smooth Music, describes her sound as “A touch of Jazz, R&B, Soul and Hip Hop too, I mix these all together to make my grooves…”. Timotha Lanae wrote ten of the 12 songs on her debut album RED. RED is a two-part project that bridges the gap between the record industry and musical theater. Timotha Lanae drew inspiration from every day life to write her singles – Radio, Talkin’ To Myself, People Pleaser, Gettin’ To Know You and My Man. Please Pleaser reached number #6 on the UK Soul Charts. Timotha Lanae is the brainchild behind the concepts of her music videos. In the music videos for Talkin To Myself and People Pleaser, she bridges the gap between her love of theater and recording by incorporating her original musical REDdington into the storyline. She portrays herself in these videos, while also portraying, Eva Reddington, the main character from her original musical REDdington. The Minneapolis Star Tribune (Minneapolis’ premier newspaper) named Timotha Lanae Outstanding Actress in a musical for her role in Respect: A musical Journey of Women. Timotha Lanae has been in several theatrical productions including H.M.S Pinafore,West Side Story, Irving Berlin’sEaster Parade, Ragtime, Singin’ in the Rain, The Producers, Footloose, All Shook Up, Beehive, Joseph and the AmazingTechnicolor Dreamcoat to name a few. Currently Timotha Lanae is working on her own musical called REDdington. A veteran on the stage and in the recording studio, Timotha Lanae also has performed all over the globe including South America for US troops, Japan, UK and the US, including performances at the legendary BB Kings in New York City and the historical Howard Theatre in Washington, D.C. Timotha Lanae is no stranger to television. She was a Season 6, American Idol Hollywood finalist, and has also been featured in numerous television advertisements for major US corporations, along with voice-over and print ads. 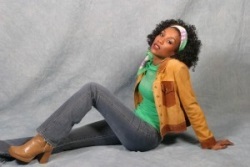 Timotha has collaborated and performed with a number of world class musicians and producers on her various projects including, Ben Obi of Savannah Street Music, R&B legend Alexander O’Neal, Michael Bland, JD Steele, Yohannes Tona and Stokley Williams of Mint Condition who is featured on her first single Radio.